Claypot chicken rice is easy to prepare and tastes absolutely delicious. 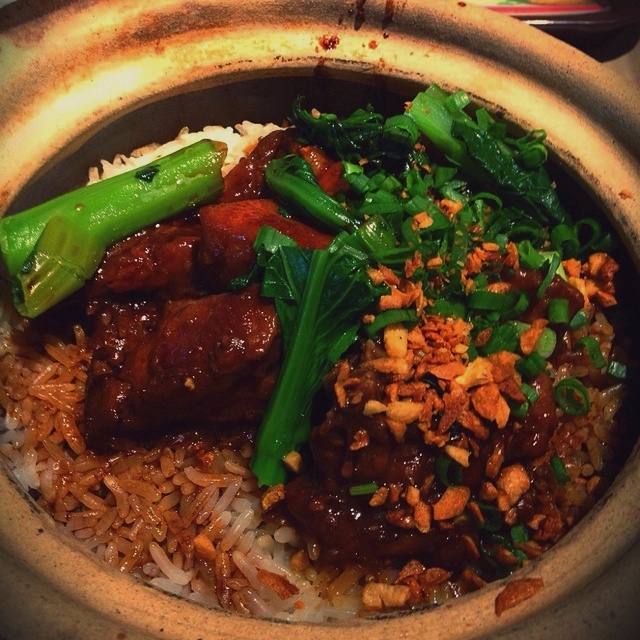 This traditional claypot dish needs slow cooking, so don’t worry about the crusted burned rice at the base of the pot – these are actually the best bits of the dish, adding a satisfying crunch to every bite. This halal version fills about 3-4 hungry people. Prepare the chicken marinate first: In a large bowl, combine chicken marinate in a bowl, whisk the mixture then add in the chicken pieces, mixing well to coat. Brine the chicken in a fridge for at least 30 minutes – preferably 2 hours. Start heating the oil in a wok, then add the garlic and ginger, fry until fragrant. Add the marinated chicken and stir. When the meat is semi-cooked, throw in the sliced mushrooms and chicken sausage, pepper and give it a good stir. In the meantime, place claypot on a hob and turn the heat to low. Add 1 tbsp of oil in the clay pot. Add salted fish bits and fry until golden brown. Turn off the heat and take out salted fish, leaving behind the oil in the claypot. Add the washed rice to the wok and turn to high heat. Using a wooden spatula, mix and allow the rice to fully incorporate the flavour with other ingredients. Add the light soy sauce and sesame oil to the wok and keep stirring and mixing for another 2 minutes. Switch off the heat and transfer the contents of the wok to the claypot. Pour in the chicken stock, then cover and turn the heat to medium low. Let it cook for about 45 minutes, checking-in every 15 minutes and giving the rice a stir or two. After about 45 minutes, add the vegetables and the salted fish, cover the lid, allowing the contents of the claypot to keep warm and slow cook on their own for another 10-15 minutes. Drizzle in the thick dark soy sauce and sesame oil over the rice and vegetables. Top with chopped spring onions and fried shallots. Serve immediately. Give the rice a stir first and dig up some of the crusted rice at the bottom if you prefer.